↑ page 200, Weinberg, Samantha. 2006. A Fish Caught in Time: the Search for the Coelacanth. HarperCollins Publishers, New York, NY. ↑ 4.0 4.1 Reuters (2007), "Indonesian fisherman nets ancient fish", Reuters UK, 2007-05-21, Retrieved on 2007-07-16. ↑ Reuters (2007), "Zanzibar fishermen land ancient fish",yahoo.com, 2007-07-15, Retrieved on 2007-07-16. ↑ page 73, Weinberg, Samantha. 2006. A Fish Caught in Time: the Search for the Coelacanth. HarperCollins Publishers, New York, NY. ↑ 8.0 8.1 Jewett, Susan L., "On the Trail of the Coelacanth, a Living Fossil", The Washington Post, 1998-11-11, Retrieved on 2007-06-19. ↑ "Ancient Indonesian fish is 'living fossil'", Cosmos Online, 2007-07-29. 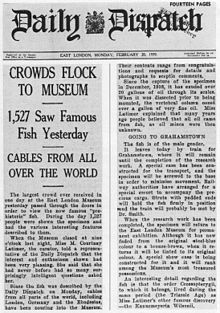 ↑ 14.0 14.1 "Dinosaur fish pushed to the brink by deep-sea trawlers", The Observer, 2006-01-08, Retrieved on 2007-06-18. ↑ "Does Tanga need a new harbour at Mwambani Bay? ", Tanzania Natural Resource Forum, 2008-03-05, Retrieved on 2009-02-25. ↑ "Population of prehistoric deep-ocean coelacanth may go the way of the dinosaurs", mongabay.com, 2009-02-25, Retrieved on 2009-02-25. หน้านี้แก้ไขล่าสุดเมื่อวันที่ 28 สิงหาคม 2561 เวลา 19:02 น.